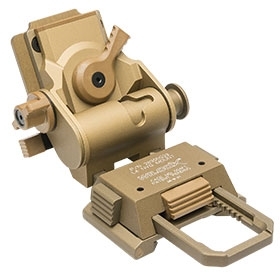 The L4 G22 mount is a variant of the extremely popular L4 G24. 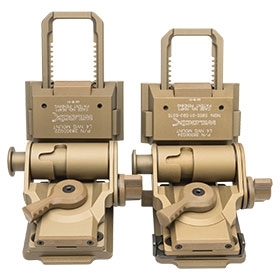 The L4 G22 features a dovetail interface for direct attachment of standard dovetail NVG’s. It is one of the most adjustable mounts available with full vertical, fore/aft, and tilt adjustment to place NVG’s in proper position. Its main difference over the L4 G24 is Increased length of travel for the horizontal adjustment, giving the L4 G22 a total of 1.4″ (approx 1/3″ more than the L4 G24). This added length helps to better accommodate shooters wearing protective or corrective eye-wear and gas masks.